Cabbage Soup is on our menu every week but each time I try and make the humble cabbage soup more interesting and flavorsome. 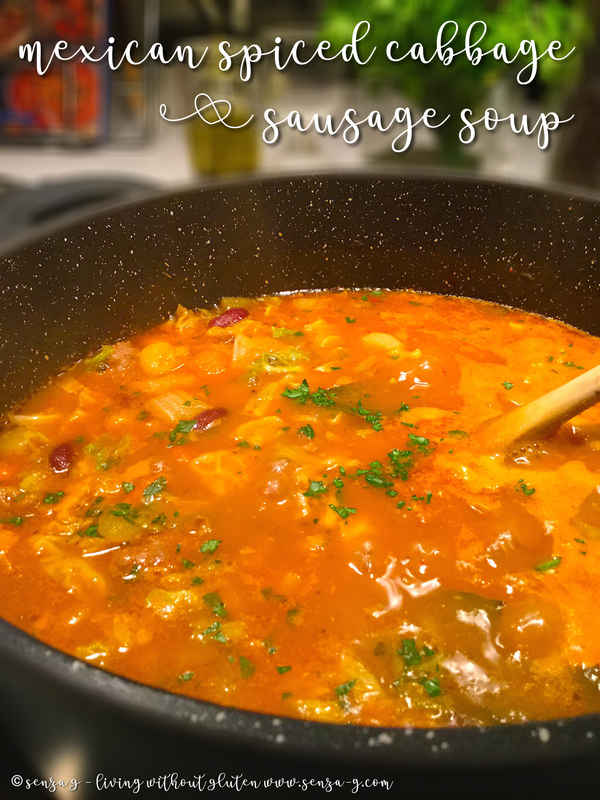 I have made it smoky with pancetta, another time with lentils and also quinoa and a few other times with curry…this time I decided to give it some Mexican Flavors. I hope you too will like it this way. Saute onion, carrots and celery in a little oil over medium heat until softened. Increase the heat and add the sausage or beef mince, cooking and stirring until browned. Mix in the minced garlic, the potatoes, tomato puree, bay leaves and the spices. Cook over medium heat, for about 5 minutes, stirring occasionally. Add the stock powder and enough water to cover completely, until potatoes start to soften. Throw in the cabbage, the kidney beans and the brown rice. Leave to cook until rice is tender. Add more water or stock if too thick. Check for seasoning and stir in some freshly chopped parsley. Drizzle with olive oil if desired.